Panthers captain Ulrich Ostergaard took a tumble in Somerset. 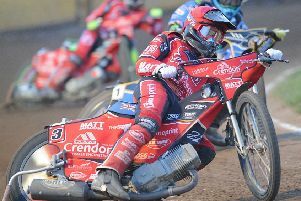 Peterborough Panthers suffered another drubbing at the hands of the top team in Premier League speedway. The city racers slumped to a 10th successive defeat against their bogey side, Somerset Rebels, when going down 57-33 last night (August 5). It’s a miserable run which stretches back to the summer of 2014. Just the four points in Somerset for Panthers' Nicolaj Busk Jakobsen. They provided only three race-winners (all of which arrived in the opening third of the meeting) and claimed just one advantage on another difficult night at The Oaktree Arena. And it came complete with an injury scare for skipper Ulrich Ostergaard who hit the deck in a heat 12 tangle with Somerset reserve Bradley Wilson-Dean. Ostergaard did manage to complete the re-run of that race, but faces a battle to be fit for a home showdown against fellow play-off chasers Edinburgh at the East of England Showground tomorrow (August 7, 5pm). Johnson said: “We knew we were going to be in for another extremely tough meeting – and that is exactly what we got. “We were pleased with the attitude of the riders, who worked hard and battled to the end on a night when we were well beaten. “To be honest, the scoreline doesn’t really do us justice. We often looked to be in a good position in the first couple of laps of races, only to then go backwards. “We still have a couple of guys mis-firing on the road, which is obviously a big concern, but they’re working hard to put things right. Panthers suffered a miserable start when on the receiving end of a 5-1, but they halved their arrears as Emil Grondal’s third-heat triumph inspired a 4-2 - their only advantage of the night. Reserve Ashley Morris had provided their first success moments earlier when taking the flag in heat two and guest number one Matej Kus soon got in on the act by triumphing in a re-run fifth heat. Kus, borrowed for the night from Newcastle, top-scored with 10 points. But two Rebels 5-1s in the space of three races left Panthers facing a double-figures deficit and their plight only worsened when a Nikolaj Busk Jakobsen tactical ride in heat nine backfired. The Dane could only manage third place behind home pair Paul Starke and Charles Wright – an outcome which all but ended any hopes of a comeback. And Somerset flexed their muscles to fire in four more advantages in the final five races to stretch their perfect Premier League record to 12 meetings. They are undoubtedly the team to beat in 2016 while Panthers, who remain third in the standings, are battling to have a chance of doing that in the play-offs.